From $116.50/mth on Payment Plan What's this? The following instalment plan options are available: $349.50/mo for 2 months* $233.00/mo for 3 months* $174.75/mo for 4 months* $139.80/mo for 5 months* $116.50/mo for 6 months* * PLEASE NOTE: The amounts are indicative. Shipping costs and applicable taxes will be added and Weta Dollars and discounts deducted before the final instalments are calculated. You will have the option to pay off early if you should change your mind. Shipping World Wide from our EU and US warehouses. Temporarily unavailable in NZ until mid-March - pre-order now. Please note a 15% non-refundable deposit is payable on pre-orders at time of order. Earn 34.95 Weta Dollars! What's this? 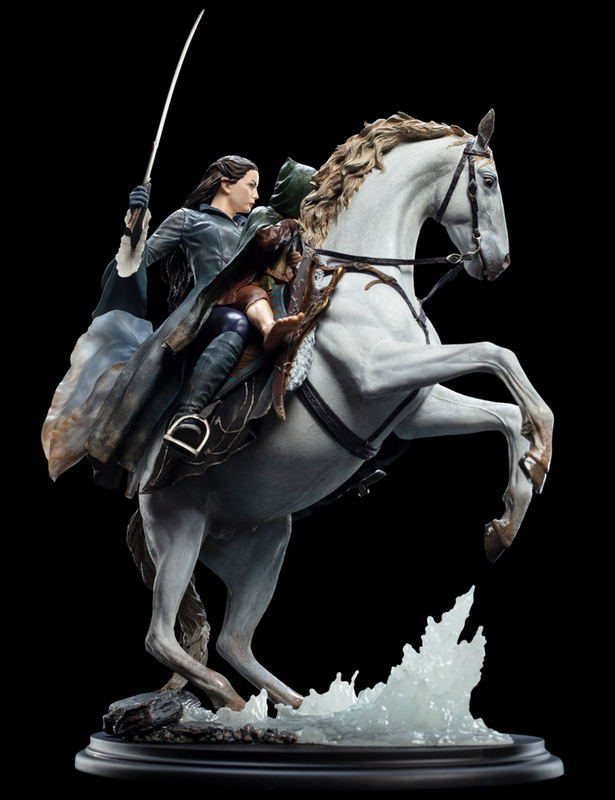 When Aragorn and his hobbit charges were hunted through the wilds of Eriador by Sauron’s Ringwraiths, the Elf princess Arwen seized sword and saddle, and rode from Rivendell to meet him. In the Trollshaw Forest Arwen found her love, but the Wraiths were close. 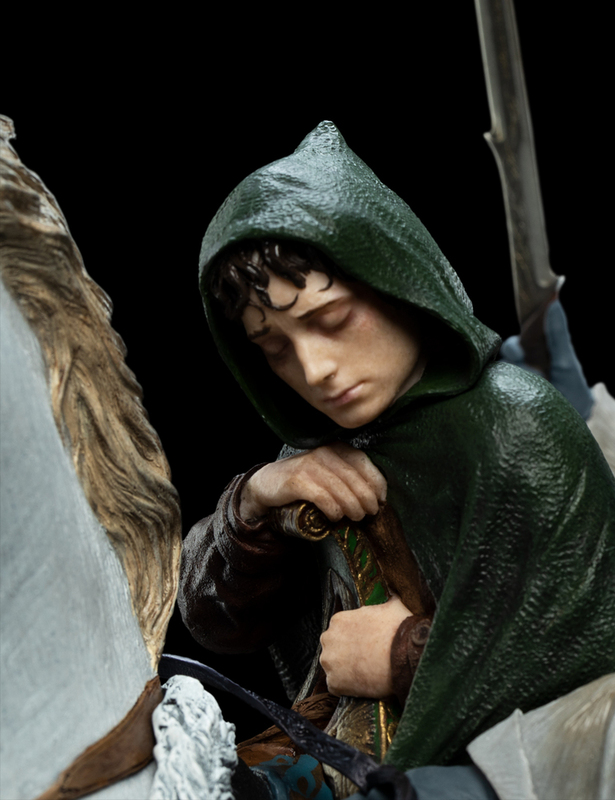 Hobbit Frodo Baggins had been stabbed by a Morgul blade, and even now its shard worked its way ever closer to his heart. On foot they had no chance, but holding Frodo to her, Arwen spurred her valiant mount Asfaloth into the sprint of his life. 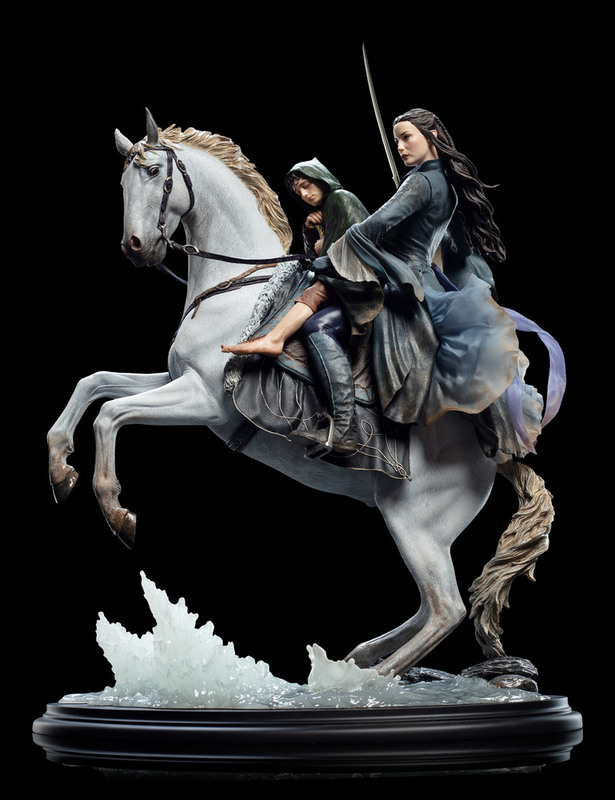 With the Nine Nazgûl at their heels, Arwen and Frodo rode alone for the Ford of Bruinen, where she hoped the enchanted waters of her father’s home might protect them from their pursuers. 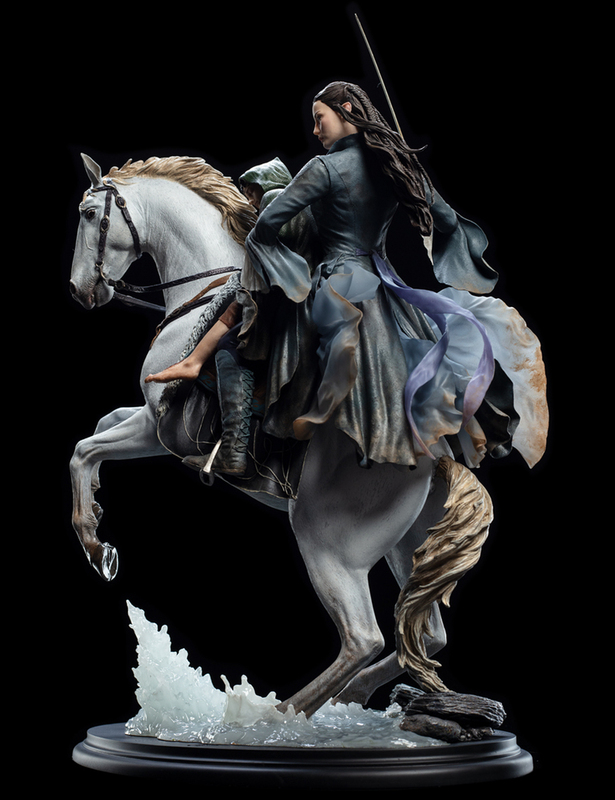 Unveiled for the first time at San Diego Comic-Con in 2018, Weta Workshop presents Arwen and Frodo on Asfaloth: our dynamic polystone that perfectly captures this dangerous and daring rescue. In an unforgettable showdown, Arwen sets her will and turns to face her shadowy pursuers. 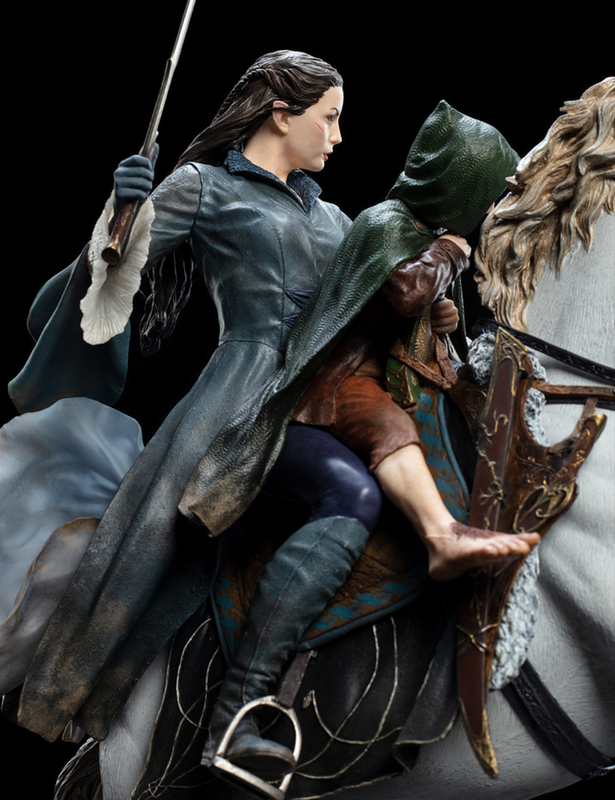 Though outnumbered and in deadly peril, Arwen fearlessly stands her ground before the Nine terrifying Ringwraiths. 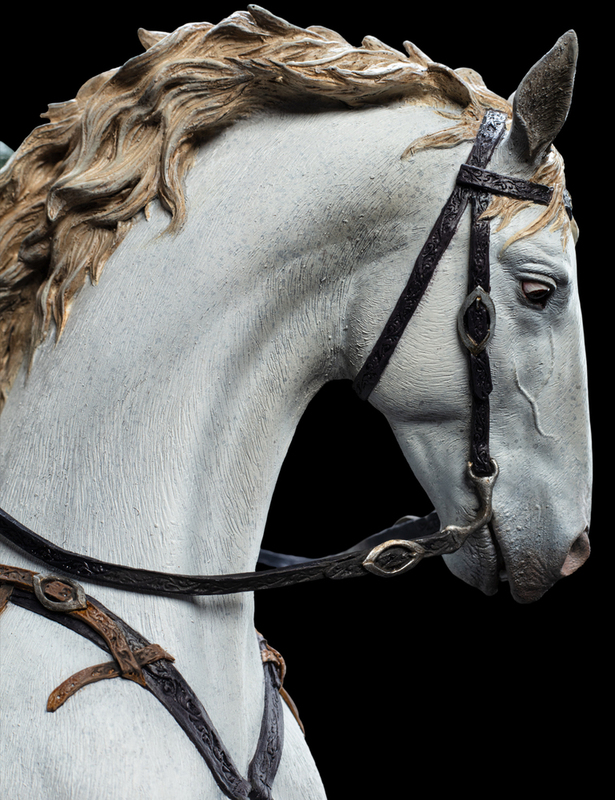 Sculpted by hand, this collectible defies expectation for what can be captured in polystone. The robes of our heroine billow out as she wields Hadhafang, etched with Elven runes, against the Nine. 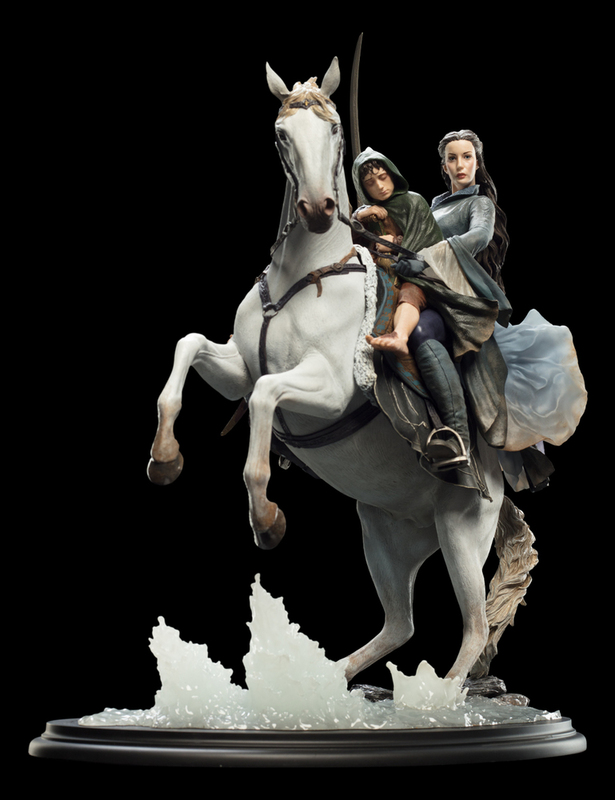 The first time Weta Workshop has crafted water in such a way: near clear, water-effect resin appears to splash up from the River Bruinen itself. 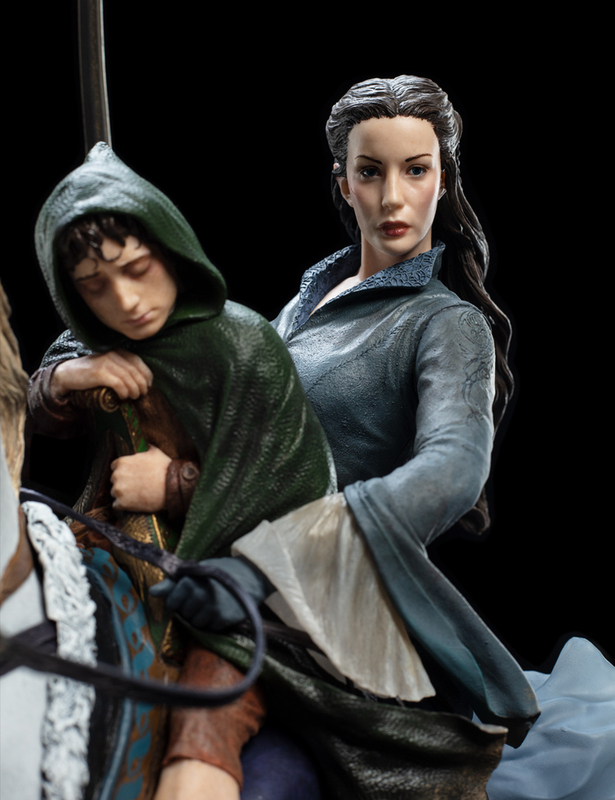 Sculpted by the masterful Jane Wenley, Arwen and Frodo on Asfaloth joins Weta Workshop’s high-quality 1:6 scale Middle-earth line; a line that is made by the very same artists and technicians who work on our movies. Please note: images are of pre-production prototype. Each item is painted by hand and variations will occur.